As expectations are high on the implementation of the 2018 budget, currently before the National Assembly, analysts have warned that its execution might be bogged down by some overlooked obstacles. For instance, the Lagos Chamber of Commerce and Industry (LCCI) identified debt service provision of N2.014 trillion as one of them. It was adjudged unsustainable by its Director General, Mr. Muda Yusuf. Hear him: “The debt service provision of N2.014 trillion is 82.6 per cent of total capital allocation and 30 per cent of total revenue. This is clearly on the high side and not sustainable,” said Yusuf. The group said it appreciated the efforts of the government to rebalance the debt portfolio in the light of increasing burden of debt service on its finances and the crowding-out effect of its borrowing on the private sector. The chamber again noted that the exchange rate assumption of N305 to the dollar was unrealistic, adding that for all practical purposes, the exchange rate in the economy is between N350 and N365 to the dollar. He highlighted the need to further reduce the cost of governance; scale up remittances of surpluses from the Ministries, Departments and Agencies (MDAs) to the coffers of government; refocus the tax drive from direct to indirect taxes in line with the National Tax Policy; and curb the growing incidence of multiplicity of taxes and levies on businesses at all levels of government. He noted that it was imperative to put in place policies to mobilise private sector capital into the infrastructure space, adding that this should include the broad spectrum of policies like tax, monetary, trade and investment. “Policy choices that create rent opportunities and distortions should be avoided. The principles of transparency, equity and level playing field should be observed at all times. This is critical for the sustenance of investor confidence,” he said. The body added the need for clarifications on the status of the budgetary appropriation for petroleum subsidy, both for the current fiscal year and 2018. “It is also necessary to throw some light on the status of the estimated N800 billion debt to oil marketers. Investors in this sector would like to see a sustainable framework for the management of petrol subsidy,” Yusuf added. 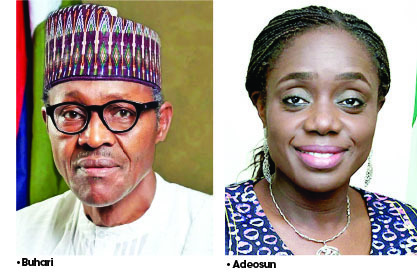 According to him, there is also a need for clarification on the status of the Asset Management Corporation of Nigeria’s (AMCON)’s debt estimated at about N5 trillion within the debt management framework of the government and framework for payment of contractor arrears, which cut across various MDAs. “The non-payment of contractor arrears has taken a huge toll on many contractors. Amount involved has been estimated at over N1 trillion,” he said. Others, who fear that the budget may not achieve its set targets, base their reasons not just on anticipated earnings from the oil and non-oil sector, but also on the failure to ensure an effective implementation of the sums earmarked for projects on each sector. Michael Obokhale, a member of the Civil Liberties Organisation (CLO) expressed fears that the N5.597 trillion would be earned from the non-oil sector to fund the budget. “The diversification programme, which is meant to boost income from the non-oil sector has been rather very slow,” said Obokhale. “In the last two years of the Buhari government, I doubt if there is anyone who can say that there has been anything significant or extraordinary that has accrued to the coffers of government from key non-oil sectors like agriculture, solid minerals, tourism, industry and aviation. It’s been abysmal figures all through. And so, when the government projects N5.597 trillion from non-oil sector, one is bound to take the information with some form of cynicism given the realities on ground,” he added. The Director General of Institute of Management Consultants, Prof. David Iornem, said irrespective of the sums budgeted for capital projects in each of the sectors, without effective monitoring of the implementation of the budget, the entire exercise would remain an exercise in futility. He said there was need to put in place budget monitoring mechanism to ensure the desired impact of the budget on the sectors and citizens. Aviation analyst, Olu Ohunayo, opined that greater efforts should be put into unlocking the dormant potential in the aviation sector so that it would contribute more to the GDP. Ohunayo, therefore, said in the early stage of the deployment of the 2018 budget, greater emphasis should be paid to projects that would grow the local airline industry. “The budget has to address the major challenges that confront the local airline industry so that we can make them more profitable,” he said. He specifically demanded investments in the purchase and installation of state-of-the-art navigational equipment across the nation’s airports so that Nigerian airlines can operate 24 hours flights – whether it is day, night or in very low visibility conditions. That way, he said, there would be maximum utilisation of aircraft and increased revenue to the airlines and the Federal Government. On his part, a development economist, Odilim Enwegbara, submitted that government would have difficulty meeting the non-oil revenue target. That implies that the government might go into more borrowings and the economy may slip into another recession. “Because government will have difficulty meeting the projected non-oil revenue in the budget, what that will mean is that the implementation of the capital expenditure will suffer if not abandoned. Given such a situation, it is possible that to continue meeting its debt service, government will go into more borrowing. “In other words, with such a ‘life and death’ situation, it is obvious that capital expenditure will have to wait and that will stall the projected growth numbers, which could lead to a weak growth or the economy slipping into recession. “At N305/$ certainly government has denied itself more money that could have accrued to the treasury during oil dollar monetisation, where the CBN purchases the oil dollars receipts while handing the three tiers of government the naira equivalent. Once the CBN has the dollars, it will definitely go on artificially defending the naira so that importers of finished consumer goods will be given dollars at a hugely subsidised rates. In doing so, the CBN will squander tens of billions of dollars in false defence of the naira. That will shrink the current foreign exchange reserves of the country. “Beside a strong naira meaning less money going to government, a strong naira also means government spending more in its domestic debt service obligations since a strong naira will mean also less liquidity in the system. “Deficit will balloon as a result of government being unable to meet its projected non-oil revenues. High fiscal deficit will in 2018/2019 further skyrocket interest rates along with the inflation rates as a consequence of high cost of money. This will also make the projected growth difficult to meet, which, if it happens, could take the country back to recession. “In the case of benchmarking of a barrel of oil, government should have increased this year’s benchmark to $50, while at the same time scrapping the illegal excess crude account. “At about N450/$, government will expect more money into its treasury as more from monetised oil money. Let government insist on the CBN focusing all its monetary policy on fighting the current high interest rates to single-digit; after all, there is nothing unheard-of if interest rates are lower than the inflation rates. “When it happens, the present high cost of debt service will reduce drastically especially with government’s borrowing policy now focusing more on external loans and less on internal borrowing, which, without the usual government patronage, will force domestic lenders to crash the rate, more so at a time the multiple borrowing windows for SMEs increasingly make them to access loans at CBN’s set single-digit interest rates,” Enwegbara said. But reacting to the budget, a don at the University of Port Harcourt, Prof. Okey Onuchukwu, said while the president’s speech appears reassuring, the poor performance of the 2017 budget, judging by the low releases, has further cast doubt on the whole intention of government. Chief Executive Officer of Cowry Assets Limited, Mr. Johnson Chukwu, said government has failed to take cognizance of the economic recession on company profits and the impact of slowing imports on Customs duties in arriving at revenue projections and was over ambitious with its oil production benchmark, which is currently at a negative variance of 400,000 barrels per day (bpd). He said capital expenditure would bear the brunt of another revenue shortfall, warning that government may be forced to review its funding model for capital projects to feature more private capital if it must get the economy going.